Every camper is unique and each has favorite camping gear they always bring with them on a camping trip. When it comes to lanterns that remains true as well. Every camper will have their favorite type of lantern though some may be specific to where the camping trip will take place. Camping lanterns can be separated into electric, fuel, and candle burning. Each offers its own benefits. Electric lanterns typically use LED lighting which provide excellent light output. They are quiet and don’t produce heat so are the safer option around children. Fuel burning lanterns can run on propane or butane. The canisters can be attached for use and refilled when empty or, in the case of butane, disposed of. These lanterns provide a lot of light. They are great for lighting a large area. They do require ventilation and shouldn’t be used in a small space. They can get hot so be careful if you use them around children. They can also be noisy. Candle lanterns aren’t used as much and they require candles for fuel. The lighting they emit is a soft light and pleasant to experience. They won’t provide a lot of light and they can be dangerous due to the burning candle inside. You’ll want to consider how much lighting you’ll need. 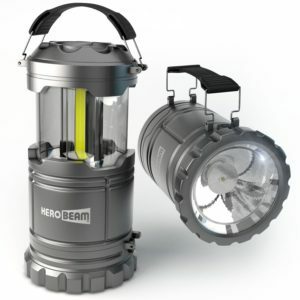 Do you plan on lighting a large area such as your campsite or will the lantern be used inside a tent? Will you need the lighting for a few hours or will it be burning for a long time? When you’re shopping for a camping lantern you should also pay attention to the weight of the lanterns you are considering. You may prefer something light weight or something more substantial. Compare prices and read reviews left by others who have purchased the lanterns you are considering. You’ll be able to sort through and find the best option for you and your family.